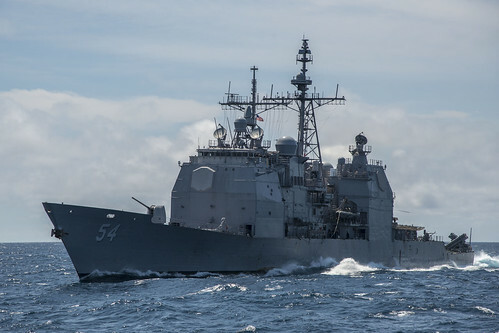 PEARL HARBOR, Hawaii - The Ticonderoga-class guided-missile cruiser USS Antietam (CG 54) damaged its propellers while anchoring in Tokyo Bay in the vicinity of Yokosuka, Japan, Jan. 31. An investigation is underway to assess the full extent of the damage. The ship safely returned to Fleet Activities Yokosuka with the help of tugs. There were no injuries to U.S. or Japanese personnel. The incident did result in the discharge of hydraulic oil into the water. The Navy is cooperating with the Government of Japan and Japanese Coast Guard in response to this issue and is taking appropriate measures to minimize impacts to the environment.